Transitions between two input clips by scrambling the pixels of the inputs within an area determined by Max Amount. The first clip is diffused away while the second clip is diffused into place. 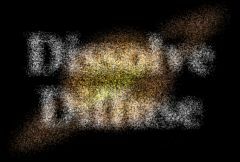 The Dissolve Percent parameter should be animated to control the transition speed. The pixelated look of this effect depends on the image resolution, so it is recommended to test your final resolution before processing. Background: Defaults to None. Ends the transition with this clip. If this input is not provided, a fully transparent background is used, showing whatever is behind it. Note that the background can not be diffused during the transition unless this input is provided. Show Max Amount: Check-box, Default: on. Turns on or off the screen user interface for adjusting the Max Amount parameter.This parameter only appears on AE and Premiere, where on-screen widgets are supported.